I am oh SO far behind on my blogging and I have oh SO many things to talk about, but the sweet hubs and I are taking a little vacation until Tuesday. I really need it after the hectic-ness that was my Christmas. I also still don't have my laptop back from the shop, so everything's kinda fallen by the wayside without it. For now, just hold on a bit longer and I hope to back to a regular schedule again soon. 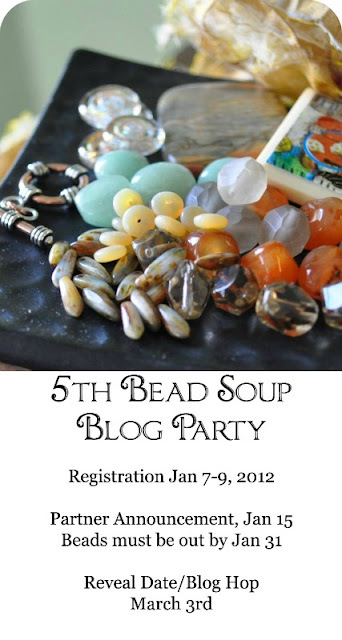 Don't forget that Bead Soup Party sign-ups are quickly approaching! Remember, Lori Anderson (of Pretty Things) a.k.a "the hostess with the mostess of the Bead Soup Party" will be doing a lottery of sorts to pick just 200 individuals to participate in the Party this time around. Anyway, our breakfast just buzzed and I've got plenty of vacation to take part in, so I'll be back to catch up with y'all next week. I am in vacation too, enjoy! Happy New Year 2012! I've been working overtime for year-end stuff at work, so there's no time to play at the jewelry table. I'm looking forward to the Bead Soup sign-up since I've never done it before. I'm hoping I get lucky enough for my name to be drawn.